Please note that the content of this book primarily consists of articles available from Wikipedia or other free sources online. 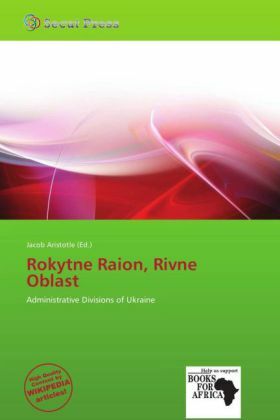 Rokytne Raion (Ukrainian: ) is a raion in Rivne Oblast in western Ukraine. Its administrative center is Rokytne. It has a population of 51 926.Rokytne Raion is probably the place with the highest birth rate in all of Ukraine. The Raion recorded a birth rate of 24.0 per 1,000 in 2008. The village council of Glinne is widely regarded as holding the record for the highest birth rate in all of Europe. Ukraine is subdivided into 24 oblasts (regions), one autonomous republic, and two "cities with special status".The system of Ukrainian subdivisions reflects country's status as a unitary state (as stated in the country's constitution) with unified legal and administrative regime for each unit.